Before wristwatches became popular in the 1920s, most watches were pocket models. They often had covers, were carried in a pocket and attached to a watch chain or fob. In the early 1900s, the wristwatch was reserved for women and considered more of a passing fad than a serious timepiece. This changed in World War I, when soldiers on the battlefield tied their watches to their wrists with leather straps. 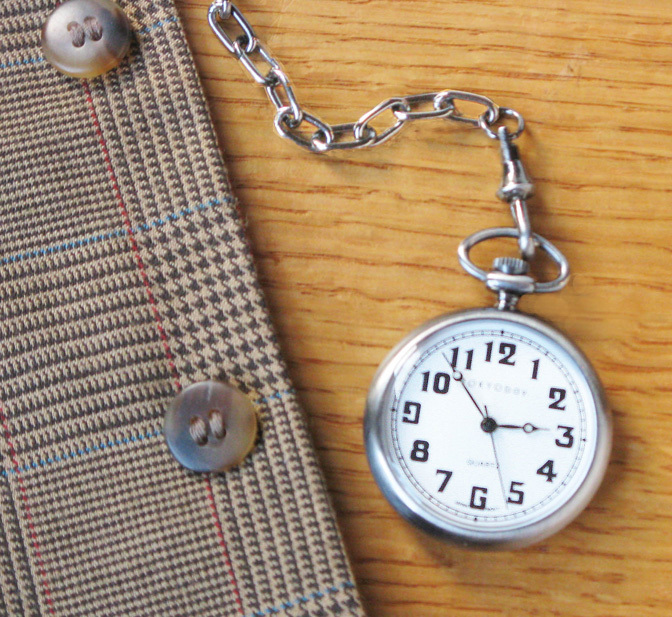 So step back in time and wear this classic pocket watch, just waiting for you to attach to your favorite vintage vest or jacket. And it looks great on women too. Quartz movement, white face (1-1/2” diameter), mineral glass, brushed silver color metal fob chain and clip.